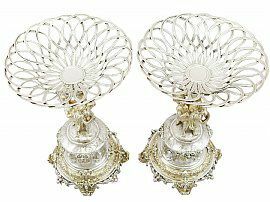 These magnificent antique Victorian sterling silver tazzas/centrepieces have a circular rounded form onto an ornamental pedestal and domed spreading foot. The surface of each decorative centrepiece is embellished with impressive double-stranded interlacing wirework decoration emanating from a central circular well. The lower portion of the basket style vessels are ornamented with impressive knopped terminals encompassed with bead decoration. The ornamental body of each tazza surmounts an exceptional cast, hallmarked silver gilt pedestal constructed of two putto* figures stood on an uneven terrain, braced and elevating a third character which supports the lower knopped portion of the vessel; this portion of the pedestal secures with a hallmarked screw fitment to the underside of the base. The lower portion of the pedestal is encompassed with chased leaf designs accented with unusual, cast and applied scrolling leaf decorated mask motifs. The waisted portion of the pedestal is encircled with further chased leaf decoration accented with convex oval bead motifs, all amidst shaped panels of matte background and incorporating four shaped vacant cartouches. The large silver gilt, circular domed spreading foot of each centrepiece is encircled with an undulating band of foliate ornamentation, all on a textured background. These impressive examples of Victorian silverware are each supported with four cast and applied scrolling bracket style feet accented with bead decoration, all conjoined with suspended fruiting festoons. These magnificent examples of antique silverware are the finest examples of their type you could hope to acquire. 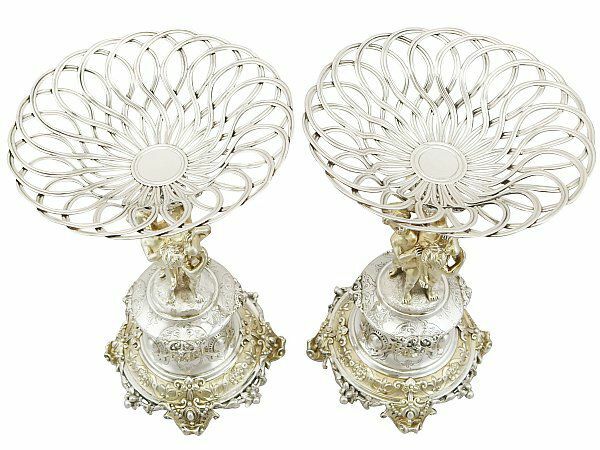 These antique decorative centrepieces are a superior gauge of silver, exceptional quality and in exceptional condition. Full hallmarks struck to the surface of each centrepiece base, in addition to part hallmarks to the figural pedestal and screw fitment are all very clear; the hallmarks are deeply struck due to the superior gauge of silver.